The beneficial effects of Peppermint essential oil have been well documented by science. 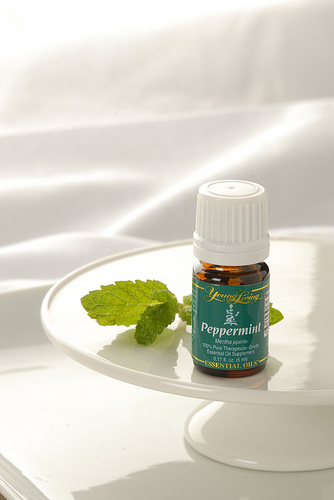 Jean Valnet, MD, studied peppermint’s supportive effect on the liver and respiratory systems. Other scientists have also researched peppermint’s role in improving taste and smell when inhaled. Dr. William N. Dember of the University of Cincinnati studied peppermint’s ability to improve concentration and mental sharpness. Alan Hirsch, MD, studied peppermint’s ability to directly affect the brain’s satiety center, which triggers a sensation of fullness after meals. According to a recent study in The Journal of the International Society of Sports Nutrition,peppermint oil may have a positive effect on exercise performance. Read Young Living's news release to learn more about this study. Peppermint can also be used to enhance the flavor of food and water. We suggest diluting this essential oil with Young Living’s V-6 Vegetable Oil Complex before topical application. Find more tips from Young Living on how to use Peppermint essential oil.